The first picture-taking setting to consider when you’re shooting with your Nikon D3100, D5100 or D7000 is the exposure mode, which you select via the Mode dial. Your choice determines how much control you have over two critical exposure settings — aperture and shutter speed — as well as many other options, including those related to color and flash photography. Auto: The camera analyzes the scene in front of the lens and tries to select the most appropriate camera settings to capture the image. Auto Flash Off: This mode works just like Auto but disables the flash. Scene modes: The D3100, D5100 and D7000 offer automatic modes geared to capturing specific types of scenes: portraits, landscapes, child photos, and such. Effects (D5100 only): This mode works just like Auto except that the camera applies one of seven special effects to the image as it writes the picture data to the memory card. A (aperture-priority autoexposure): In this mode, you choose the aperture, and the camera automatically chooses a shutter speed to properly expose the image. All three semi-automatic modes give you complete access to all the camera’s features. So even if you’re not ready to explore aperture and shutter speed yet, go ahead and set the mode dial to P if you need to access a setting that’s off-limits in the fully automated modes. The camera then operates pretty much as it does in Auto mode but without limiting your ability to control picture settings if you need to do so. Manual: In this mode, represented by the letter M on the Mode dial, you select both the aperture and shutter speed. But the camera still offers an assist by displaying an exposure meter to help you dial in the right settings. Guide (D3100 only): Selecting this setting accesses the guided menu system. 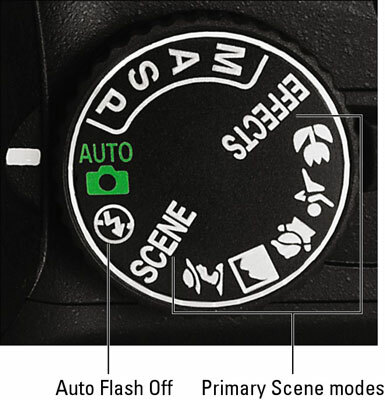 U1 and U2 (D7000 only): These two settings represent the pair of custom exposure modes that you can create. They give you a quick way to immediately switch to all the picture settings you prefer for a specific type of shot. One very important and often misunderstood aspect about the exposure modes: Although the Mode dial setting determines your access to exposure and color controls as well as to some other advanced camera features, it has no bearing on your focusing method. You can choose from manual focusing or autofocusing in any mode, assuming that your lens offers autofocusing. However, some options that let you adjust the camera’s autofocusing behavior are available only in P, S, A, and M exposure modes.